Thomas “Smitty” Smith has worked with just about every species of animal that has come through the zoo’s doors since he started as a zookeeper in 1994. He worked hard and his dedication landed him the role of head zookeeper, a title which came with the responsibility of being a mentor and teacher for many new zookeepers who came and went through the years. 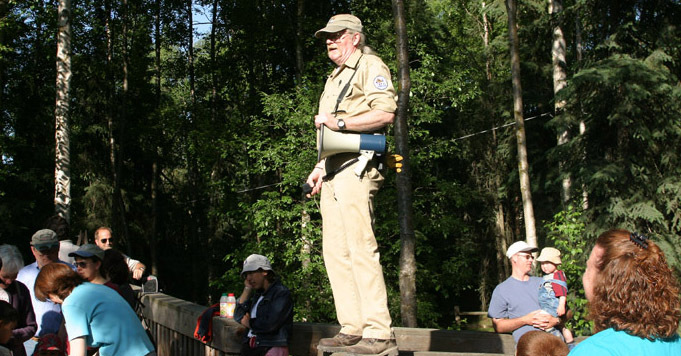 He played a vital role in helping zoo educators with thousands of behind-the-scenes encounters for camps and school groups. He led thousands of tours and was a presenter in hundreds of education talks over his 24 years at the zoo. His charisma and positive nature gave him an immediate connection with zoo visitors and co-workers. He was most recently named Deputy Curator to assist the Curator with managerial duties in the animal department. Smitty has played a key role in the care of tigers, snow leopards, polar bears, porcupines, hoofstock and many other animals over the years. He has shared in the ups and downs of zoo life - the joys of new animals arriving along with the heartbreak of losing animals. Smitty’s name is well known among longtime supporters and his departure will leave a hole in the fabric of the zoo. His ability to work well across all areas of the zoo and with the general public is a talent that will be sorely missed. Change is a guarantee in life and we feel lucky to have had Smitty as a constant and positive presence for so many years. We will miss you, Smitty. Inside joke: The next time we see you, we will "give YOU a dollar"!